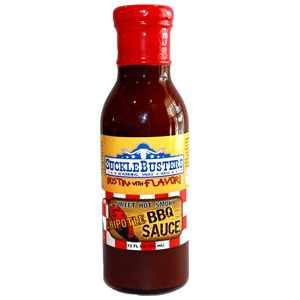 Sucklebusters BBQ sauces are renowned for their flavor and all natural ingredients. Sucklebusters' earned a tremendous honor recently when their Original sauce won first prize at the American Royal BBQ competition﻿ in Kansas City, MO. In addition to that top prize, Sucklebusters' various sauces have garnered several awards on the competition circuit since 2009. This week, I cracked the seal on a bottle of their Chipotle BBQ Sauce. SuckleBusters Chipotle BBQ Sauce spices up their Original recipe with smoke chipotle spice. According SuckleBusters' website, the heat is "just hot enough to keep'em coming back for more." The sauce has a medium thickness and a smooth, glossy texture. I used the Chipotle BBQ Sauce on smoked pork ribs. The sauce made an excellent finishing glaze. Paired with SuckleBusters' mild Competition BBQ Rub, the sauce's spice brought a welcome lip tingling finish. I've professed my affinity for sweet and spicy sauces numerous times on The "Q" Review. SuckleBusters Chipotle BBQ Sauce is definitely one of the best. Much like Demon Pig's Blaze Orange and Big Dave's Honey Chipotle sauces (Two of my absolute favorites), SuckleBusters Chipotle BBQ blends the sweet seemlessly with the spicy. The sauce is sweeter than I expected from a Texas product, but flavor is outstanding. If you like a little bit of spice in your "Q", SuckleBusters Chipotle BBQ Sauce is a great option for glazing ribs or chicken. Using the sauce in tandem with SuckleBusters rubs is a smart move as well. 0 Response to "Sucklebusters Chipotle BBQ Sauce"